Mobile food truck will bring fresh produce to various locations around the Island. Some visitors to the Oak Bluffs Public Library on Tuesday found themselves perusing not only the familiar stacks, but boxes of Island-grown produce in a truck on the lawn. 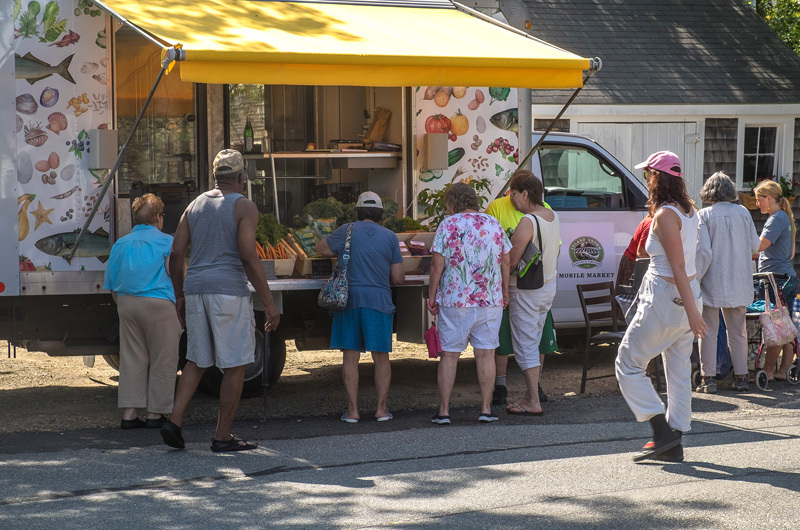 It was the second stop for a mobile farmers' market that debuted earlier in the day at Woodside Village in Vineyard Haven. 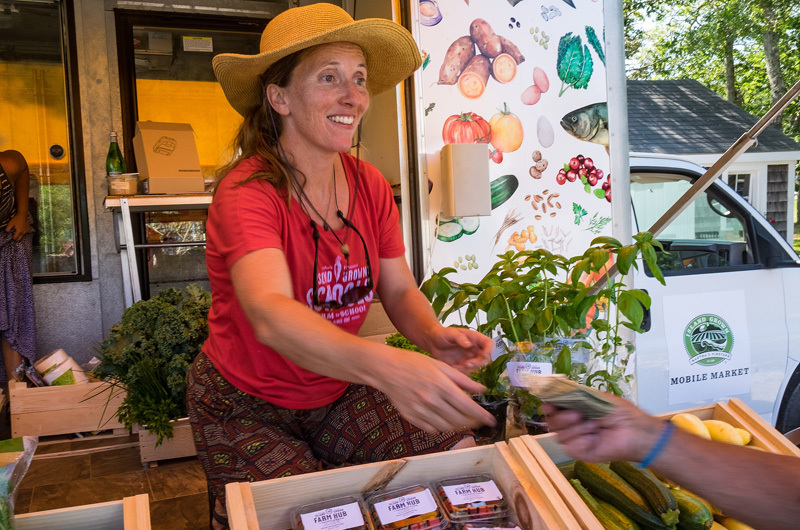 The converted florist truck attracted a line of customers on the lawn behind the library, as upbeat music played quietly on a sound system and employees of Island Grown Initiative arranged boxes of produce and chatted about the day. “We got a little bombarded when we got here,” said Sophie Abrams, who was manning the truck along with Meg Athearn and Kat Soni. She noted a minor mishap at Woodside Village, when the truck awning briefly malfunctioned. But other than that, she said, the mobile market’s first day was a success. As part of a three-year pilot program run by IGI, the market will stop at seven locations on the Island every week, delivering local produce at a discounted price to anyone who shows up. The idea is to target communities with elderly, low-income or disabled residents, and to arrive in the evening when more working families can shop. The truck will stop at Woodside Village and the Oak Bluffs library on Tuesdays; Hillside Village, the Boys and Girls Club and American Legion on Thursdays; and Morgan Woods and the Wampanoag Tribe area on Sundays. IGI received a $62,000 grant from the state Department of Agriculture this spring to buy and retrofit the truck, which is decorated with artwork by Ashley Chase, showing fish, greens, eggs and other local food items. (Bluerock Design turned the artwork into a wallpaper-like pattern, and the Martha’s Vineyard Screenprinting Co. applied it to the truck.) In a bit of irony, at least part of the truck once served as a performance stage for McDonald’s. Mobile markets have been popping up around the country to serve areas known as food deserts, which are more than a mile away from a grocery store. The Island market is based on similar projects in Baltimore, Md., and Washington, D.C.. It is one of several recent initiatives to address food insecurity on the Vineyard, including a new healthy snacks program at the Martha’s Vineyard Boys & Girls Club, and a summer pilot program to provide lunches to kids who qualify for reduced lunches at school. In addition, the Island Food Pantry, which usually closes for the season, will remain open one day a week this summer. The most popular items on Tuesday were strawberries, she said. Summer squash and green leaf lettuce also held their own. The mobile market logged 17 customers at Woodside and 19 at the Oak Bluffs Library on Tuesday evening. Purchases at the market qualify for the state’s Supplemental Nutrition Assistance Program (SNAP), including the Women, Infants and Children (WIC) program, and a new Healthy Incentive Program (HIP) that is in the first year of its own three-year pilot. Ms. Soni said people at Woodside Village have already taken advantage of the new program. Ms. Abrams said the routes will continue through Columbus Day, after which IGI will evaluate the program and make any necessary adjustments. She said one goal is to keep the rounds going later into the season by relying more on root vegetables, greenhouse produce and cold-weather crops. She was optimistic that the program would eventually become a permanent service for the Island. “The pilot’s going to go at least for three years, and hopefully forever,” she said. For more information, visit igimv.org. Just to clarify I'm wondering if anyone can purchase? Or is that frowned upon? "...delivering local produce at a discounted price to anyone who shows up." I believe that means anyone.